Kendall Coyne Schofield skates during the NHL All-Star skills competition in San Jose, Calif., on Jan. 25, 2019. Women’s hockey star Kendall Coyne Schofield said Thursday she doesn’t believe NBC Sports analyst Pierre McGuire questioned her knowledge of the sport during an awkward pre-game interaction this week. McGuire was criticized on social media for the situation that occurred during Wednesday night’s game in Pittsburgh between the Penguins and the Tampa Bay Lightning. During the broadcast on NBC Sports Network, the two were near the ice and he told Coyne Schofield which benches the teams were on and noted the network was paying her to be an analyst, not a fan. McGuire has been calling women’s hockey games for more than 15 years, including several Olympics. In a statement posted to her Twitter account, Coyne Schofield said she has known McGuire for years and she knows he respects her “as a hockey player, a woman and a friend” and she didn’t think twice about the situation when it happened. After watching the segment on video, Coyne Schofield said, she understands why people would think it was inappropriate and would have been offended if she saw a man say that to a female athlete. “While I wish it came out differently, I know Pierre doesn’t question my hockey knowledge,” she wrote. “What IS important is for every young girl reading this to know it doesn’t matter what anyone thinks of my hockey knowledge — because I do not doubt my hockey knowledge,” she wrote. 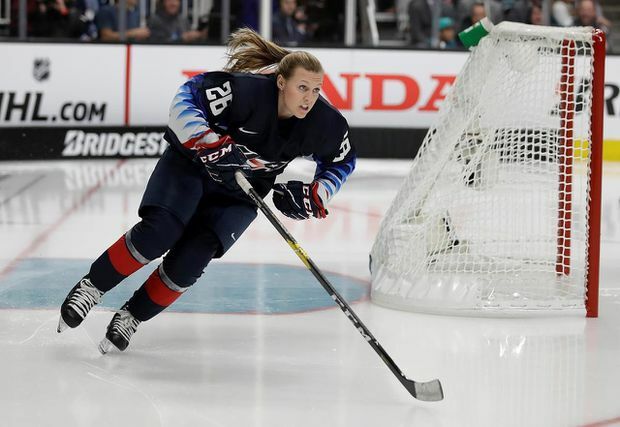 Coyne Schofield, an Illinois native who is on the Minnesota Whitecaps roster in the NWHL, won a gold medal playing for the U.S. at the 2018 Olympics and a silver medal four years earlier. She was one of the biggest stars of NHL All-Star Weekend as she wowed in replacing Colorado’s Nathan MacKinnon in the fastest skater competition. Agent Ken Magnuson said Coyne Schofield wanted her statement to stand without further comment.